Definition at line 43 of file llvograss.h. Definition at line 93 of file llvograss.h. Definition at line 74 of file llvograss.cpp. 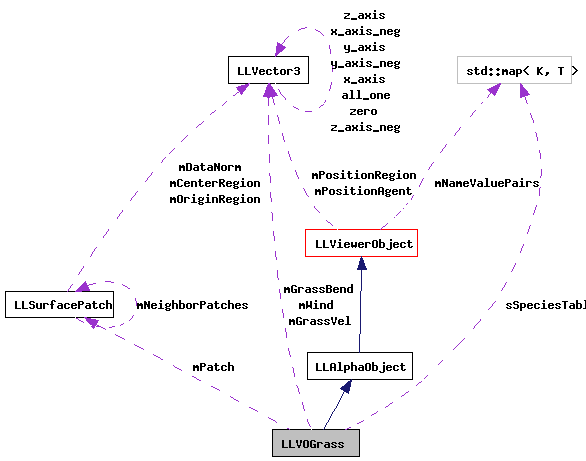 References LLVector3::clearVec(), f, GRASS_MAX_BLADES, LLViewerObject::mbCanSelect, mBladeWindAngle, mBWAOverlap, mGrassBend, mGrassVel, mLastPatchUpdateTime, mNumBlades, mPatch, NULL, LLViewerObject::setNumTEs(), LLViewerObject::setTEColor(), and TRUE. Definition at line 92 of file llvograss.cpp. Definition at line 260 of file llvograss.cpp. Definition at line 392 of file llvograss.cpp. References LLPipeline::allocDrawable(), LLViewerObject::mDrawable, and LLPipeline::RENDER_TYPE_GRASS. Definition at line 437 of file llvograss.cpp. References dz_x, dz_y, exp_x, exp_y, f, face, LLViewerRegion::getLand(), LLSurfacePatch::getLastUpdateTime(), LLViewerRegion::getOriginAgent(), LLViewerObject::getPositionRegion(), GRASS_BLADE_BASE, GRASS_BLADE_HEIGHT, height, i, LLViewerObject::mDrawable, mLastPatchUpdateTime, mNumBlades, mPatch, LLXform::mPosition, LLViewerObject::mRegionp, LLXform::mScale, mSpecies, LLVector3::mV, LLVector3::normVec(), LLSurface::resolveHeightRegion(), LLSurface::resolvePatchRegion(), rot_x, rot_y, S32, LLPipeline::sCompiles, sSpeciesTable, v1, v2, VX, VY, VZ, w_mod, width, x, and y. Definition at line 553 of file llvograss.cpp. Definition at line 299 of file llvograss.cpp. References LLSurfacePatch::getLastUpdateTime(), gPipeline, LLPipeline::hasRenderType(), LLPipeline::markRebuild(), LLViewerObject::mDead, LLViewerObject::mDrawable, mLastPatchUpdateTime, mPatch, LLDrawable::REBUILD_VOLUME, LLPipeline::RENDER_TYPE_GRASS, and TRUE. Definition at line 117 of file llvograss.cpp. References LLXmlTree::addAttributeString(), alert_done(), LLViewerWindow::alertXml(), dz_x, dz_y, exp_x, exp_y, f, F_PI, FALSE, gDirUtilp, LLDir::getExpandedFilename(), LLXmlTreeNode::getFirstChild(), LLXmlTreeNode::getNextChild(), LLXmlTree::getRoot(), LLControlGroup::getString(), GRASS_BLADE_BASE, GRASS_DISTRIBUTION_SD, GRASS_MAX_BLADES, gViewerArt, gViewerWindow, i, LLUUID::isNull(), ll_frand(), LL_PATH_APP_SETTINGS, llendl, llerrs, llinfos, llwarns, LLVOGrass::GrassSpeciesData::mBladeSizeX, LLVOGrass::GrassSpeciesData::mBladeSizeY, LLVOGrass::GrassSpeciesData::mTextureID, LLXmlTree::parseFile(), rot_x, rot_y, S32, LLUUID::set(), sMaxGrassSpecies, sSpeciesTable, TRUE, u, v, w_mod, x, and y. Definition at line 294 of file llvograss.cpp. Definition at line 407 of file llvograss.cpp. References face, gCamera, LLCoordFrame::getAtAxis(), LLCoordFrame::getOrigin(), LLViewerRegion::getOriginAgent(), LLViewerObject::getTEImage(), LLFace::GLOBAL, llendl, llinfos, LLAlphaObject::mDepth, LLViewerObject::mDrawable, mNumBlades, LLXform::mPosition, LLViewerObject::mRegionp, mSpecies, NULL, LLPipeline::sCompiles, and sSpeciesTable. Definition at line 265 of file llvograss.cpp. 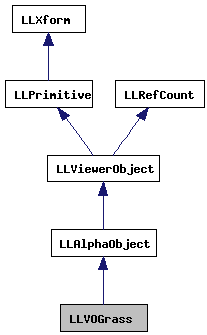 References f, LLPrimitive::getAcceleration(), LLPrimitive::getAngularVelocity(), LLPrimitive::getVelocity(), gPipeline, llendl, llinfos, LLPipeline::markRebuild(), LLViewerObject::mDrawable, LLViewerObject::processUpdateMessage(), LLDrawable::REBUILD_VOLUME, LLPrimitive::setAcceleration(), LLPrimitive::setAngularVelocity(), LLPrimitive::setVelocity(), TRUE, updateSpecies(), and LLVector3::zero. Definition at line 321 of file llvograss.cpp. References gCamera, LLAgent::getCameraPositionAgent(), LLViewerObject::getMaxScale(), LLViewerObject::getPositionAgent(), LLCamera::getView(), LLCamera::getViewHeightInPixels(), LLVector3::magVec(), LLViewerObject::mAppAngle, LLViewerObject::mPixelArea, RAD_TO_DEG, and range. Definition at line 570 of file llvograss.cpp. References LLXform::clearChanged(), gPipeline, LLPipeline::markRebuild(), LLViewerObject::mDrawable, LLPointer< Type >::notNull(), LLDrawable::REBUILD_ALL, LLXform::SHIFTED, and TRUE. Definition at line 73 of file llvograss.h. Definition at line 400 of file llvograss.cpp. References LLFastTimer::FTM_UPDATE_GRASS, plantBlades(), and TRUE. Definition at line 352 of file llvograss.cpp. References face, FALSE, gPipeline, GRASS_MAX_BLADES, llmax(), llmin(), lltrunc(), LLPipeline::markRebuild(), LLViewerObject::mDrawable, mNumBlades, LLXform::mScale, LLVector3::mV, LLDrawable::REBUILD_ALL, S32, and TRUE. Definition at line 97 of file llvograss.cpp. References LLViewerImageList::getImage(), gImageList, llendl, llinfos, mSpecies, LLViewerObject::mState, LLViewerObject::setTEImage(), and sSpeciesTable. Definition at line 340 of file llvograss.cpp. References LLViewerImage::addTextureStats(), fsqrtf, LLViewerObject::getTEImage(), gPipeline, LLPipeline::hasRenderDebugMask(), llformat(), LLViewerObject::mPixelArea, LLPipeline::RENDER_DEBUG_TEXTURE_AREA, and LLViewerObject::setDebugText(). Definition at line 96 of file llvograss.h. Definition at line 97 of file llvograss.h. Definition at line 106 of file llvograss.h. Definition at line 107 of file llvograss.h. Definition at line 103 of file llvograss.h. Definition at line 104 of file llvograss.h. Definition at line 114 of file llvograss.h. Definition at line 101 of file llvograss.h. Referenced by getGeometry(), idleUpdate(), and LLVOGrass(). Definition at line 115 of file llvograss.h. Referenced by getGeometry(), LLVOGrass(), plantBlades(), and updateLOD(). Definition at line 99 of file llvograss.h. Definition at line 95 of file llvograss.h. Referenced by getGeometry(), plantBlades(), and updateSpecies(). Definition at line 105 of file llvograss.h. Definition at line 83 of file llvograss.h. Referenced by add_object(), and initClass(). Definition at line 117 of file llvograss.h. Referenced by cleanupClass(), getGeometry(), initClass(), plantBlades(), and updateSpecies().